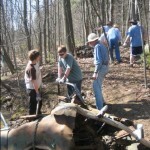 Ascension was nominated to be a Cool Congregation by Vermont IPL‘s coordinator Betsy Hardy, who praised the congregation’s efforts to “educate faith community members about the climate crisis and the need to make significant changes.” Ascension achieves this goal through educational programs that both inform members about their impact on the environment and reach out to the local community. In Spring 2008, the church sponsored an interfaith lecture series entitled “Greening Our Religions.” About 100 people attended each of the five lectures, and the series drew attention from local media and others who were happy to see a faith community working at the forefront of environmental issues. The educational programs at Ascension are coupled with hands-on action that begins in the church’s own backyard with efforts to care for the surrounding woodlands. Ascension recently partnered with students from the University of Vermont to clean up rubbish from the nearby Bartlett Brook. Currently, the church is developing a plan to maintain and improve the health of the trees, plants, and animals living in the woodlands. Ascension also has a successful energy conservation campaign that began in mid-2005. Changes such as switching lightbulbs and replacing old and inefficient refrigerators have reduced the church’s annual electricity usage from 51,080 kilowatt hours (kWhs) in 2005 to 28,618 kWhs in 2008. These changes are not only shrinking the church’s carbon footprint-they also equal an estimated $3,000 savings on the church’s annual electricity bill. Ascension also plans to upgrade its heating system with the help of a grant from the Vermont Agency of Natural Resources to a more efficient system that, when completed, will reduce CO2 emissions by 8 tons annually. Pastor Wright credits the success of Ascension’s programs to a strong network of leadership from within the congregation. She advises other faith communities interested in going green to learn from the work of other churches and begin with “small successful steps that keep the momentum going.” For Ascension Lutheran Church, this momentum has culminated in a creation care “energy explosion” that has earned this congregation the title of a Cool Congregation! Cool Congregations are faith communities recognized by the national Interfaith Power & Light campaign for their outstanding work toward reducing their carbon footprint and promoting creation care.